FURIOUS traders have told how workers downed tools after their firm collapsed – leaving major roadworks lying unfinished. City council contractors Land Engineering went into administration with a new cycle lane and pavement in Leith Walk unfinished. Now businesses fear months of delays and lost takings with machinery abandoned and jobs half done. “They left big holes, a big mess and big fences everywhere,” said Ray Withey, business partner at electrical and sporting goods store Borland’s, on Croall Place. “What I’m getting from my customers all the time is ‘we can see you but we can’t get near you’. Once they go and find an out-of-town shop we have lost them for good. 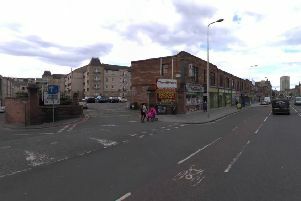 The work is part of a wider £5.5 million programme of improvement works aimed at revamping the top of Leith Walk. Under the Leith Programme, the city council has put forward plans for segregated cycle lanes in both directions along Leith Walk, as well as alterations to parking and loading areas. Richard Haigh, owner of the Black Fox pub, said there had been little sign of activity for the best part of a month. “Originally the project was due for completion around the start of May and it’s been pushed back and back,” said Mr Haigh. “It’s been weeks since we have seen work on site. We were told the company has gone bust. Mr Haigh said delays to the work were threatening a traditional summer spike in business – while waste collection and deliveries will also be hit. “All the businesses in the area are quite closely knit and we are all incredibly frustrated by this and trying to make as much noise to the council as we can,” he added. Latest accounts registered at Companies House reveal Land Engineering posted £305,000 losses in 2015. A council spokeswoman said “a comprehensive” financial assessment, including an independent credit check, was carried out on the firm before they were awarded the work. She added: “This is extremely frustrating for the council, as this project has been progressing on schedule and in budget, and we fully appreciate how disappointing this will be for businesses and residents.